At first I did not recognize the name, Amy Finley but after reading Mrs. Finley’s bio, I realized who she was. Amy was the winner of season three of The Next Food Network Star on the Food Network channel. This is funny as this is probably the last season that I watched of this show. 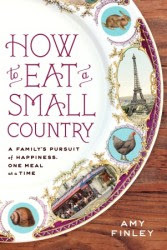 Reading this book made me think of Julia Child. This might have been what she and her husband experienced if they had children but of course Julia Child also embraced France. Amy did embrace France and all the food it had to offer but maybe a little too much or I should say her husband did. For example there was the rouille soup incident at Le Rhul. As much as I did like reading about all the different experiences Amy had in France, I was only mildly interested. 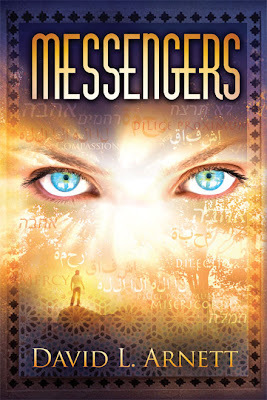 I received an email from author, Rebecca O'Connor. She wrote Lift. A Pugs Tale is a nice cozy mystery read. It brings the bark without the bite. Hope McNeill works at the Metropolitan Museum of Art. She is caring for her boyfriend’s pug, Max, while he is gone. 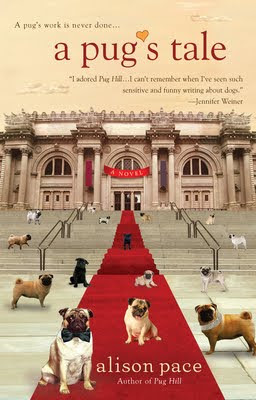 Tonight in honor of famous celebrity and philanthropist, Daphne Markham; the museum is hosting “Pugs Night”. This will be the first time that “officially” Hope will get to bring Max to the Met. Though, if it was not for this party and the fact that Hope got to bring Max, she would be at home. Hope is more of a home body. After a disastrous situation involving Max and Daphne’s pug, Hope and Max are excused form the party. On her way out of the Met, Hope uncovers a lost painting. It is up to Hope and Max to solve the mystery of the lost painting. An excellent beginning to The Templar Chronicles set of tales. Can’t wait for number two titled The Scream of Angels! Cade Williams didn’t do orders; he also didn’t do Rules - especially when they got in the way of his job as a Knight Commander of the Templars. Cade didn’t start out that way but having your wife killed in front of you tends to change your outlook. Sean Duncan headed up the Protectors group of the Templars and is in charge of care of the Preceptor for North America. They are in Connecticut to investigate a Templar group left in ruins, all dead who were there at the time of the event. How did the bad guys get in? How did they create such chaos. Answers are needed and fast! Which is when the Preceptor brings in Cade and Echo Team. 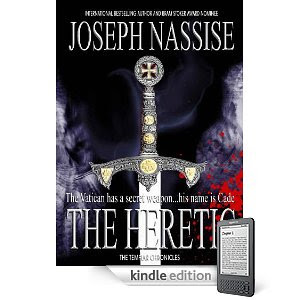 Not a popular choice as Cade (aka The Heretic) is known to break any rule in his way to get to the source. He immediately drafts Duncan to replace a team member lost and there the real conflict begins. Good/Evil vs. Good vs Really evil. The winner? We shall see. The Loser? Us if things turn wrong. 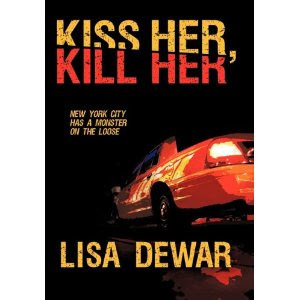 Kiss Her, Kill Her is worth your money and time. Tarryn Cooper Love is a serial killer. His inspiration is Ted Bundy. Only, Tarryn does not want to be like Ted but to surpass him and make his mother proud. Tarryn has the perfect job for getting close to women. He is a taxi driver. Carmen is a trophy wife. She is tried of being mistreated by her husband. When Tarryn picks Carmen up, he is already thinking about his plans for her. This is until, he hears Carmen’s story. Carmen informs Tarryn that she wants to end her life. This is not good for Tarryn and he likes the fear in his victims before he finishes them off. Tarryn is memorized by Carmen and decides to get to know her better and boost her confidence before he strikes. 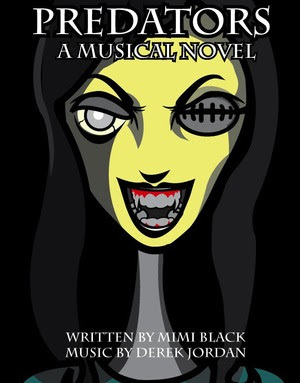 Undertakers: Rise of the Corpses is a refreshing, yummy read. Young, William Karl Ritter was getting ready for school like any other day. Only this day was different. There is something odd about Old Man Pratt, Will’s next door neighbor. His skin seems to be whiter and drier than usual. Though this is not what is different. He is grumpy but that is nothing new. The “dead” giveaway that something is up with Old Man Pratt is the beetles and the rotten flesh smell. Old Man Pratt is a Corpse. Things get weirder when Will arrives at school. The teachers are Corpses as well. Will escapes with the help of another student. Will is brought to a hideout location. This is where Will learns that he has the gift of “sight”. He can see the Corpses. Will is recruited as the newest member of the Undertakers. 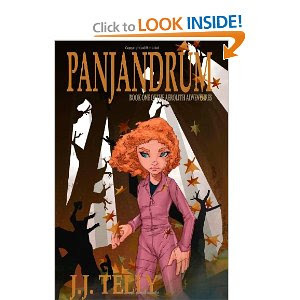 They are mainly formed by a group of children and they are the only defense against the Corpses. 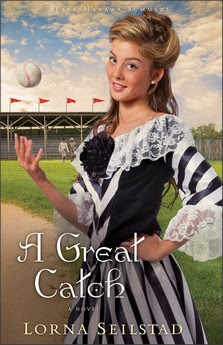 A Great Catch swings and hits a home run! Emily Graham is more interested in fighting for women’s rights to vote than finding a husband. Unfortunately, for her, Emily’s Aunts will not let Emily become a spinster. They aim to find Emily a suitor. Carter Stockton is the pitcher for the Manawa Owls baseball team. He knows Emily but in the past she was always Martin’s sister. Now that she is grown up, Carter is looking at her in a new way…as a woman. Carter plans to show Emily that she needs a man in her life. It is up to Emily to vote for the right choice. Revenge is sweet with Travis Mays and Mr. Young! After an incident five years ago, Travis Mays hangs up his police uniform and relocates to the Idaho Mountains. There Travis teaches at the university on the topic of criminology. Travis hires Jessie White Eagle to guide him down the river. It seems that no matter where Travis escapes to, he can not escape trouble. Jessie’s brother, Tommy is missing. Jessie’s father is the police chief. He asks Travis for his assistance. It seems that with Travis’s past comes an enemy who is stalking him. Who will survive this cat and mouse hunt? In a world of long lived Catholicism the choices are never easy. When the oldest son, the “Golden Boy” is terribly injured no one knows where to turn except the Church. The Church, as often happens; falls short. By a mile or two. 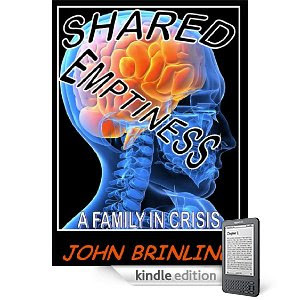 In Shared Emptiness, author John Brinling shows us both sides of the coin. The daughter, outshone on every level by her older brother, who clings to Mass as a life jacket. Mom who has grown up in the Church and feels herself damned for thinking of killing her only son. Dad who isn’t as strict on going to Mass (even if right across the street) but loves to play the horses and loves his family even if he does a piss-poor job of showing it. Then the aunts and uncles and cousins weigh in and they are as torn as the Carters. They have their own issues of pregnancies, dead children, unloved spouses and are getting no answers there, either. 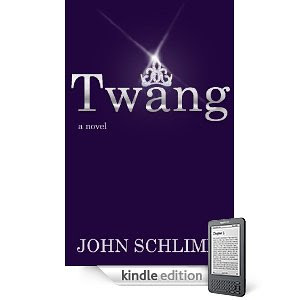 Twang hits a high note and harmonizes perfectly! Salome Field is one half of the famous country duo The Field Sisters. Her other half is Willa. Billie Blotter’s Nashville Notes. He is working on putting together a tribute book on country’s hottest superstars. The book is called Nashville Undressed. Come join Billie as he interviews some of the greatest country stars and gets the dirt on them. 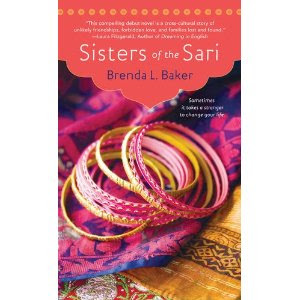 Sisters of the Sari had charm. Kiria knew that if she was going to vacation in India that she would not go to any of the most popular places. She would go to the southern area of India. Kiria soon realized that she was out of her element. Lucky for her that Santoshi was there to help her. When Kiria learns where Santoshi lives, she comes up with the idea of building a hotel for independent, women like Santoshi. Will Kiria achieve her goal or will the hotel go crumbling down before it is even started? The Samaritan will have you keeping your friends close and your enemies even closer! First multi-millionaire Jeremy Silverstone is murdered and $250 million dollars are missing. Someone is gunning down people like sheep to the slaughter. Several people are gunned down in a bar. One of the people killed was Karen Easter. She was the wife of Kevin aka Hatch Easter. John “Jack” Slattery is the director of the CIA. He wants the killer stopped before the body count gets too high. With so many suspects from mob don himself, Anthony DiFilippo to possibility, Kevin Easter, it will be one action-packed ride. 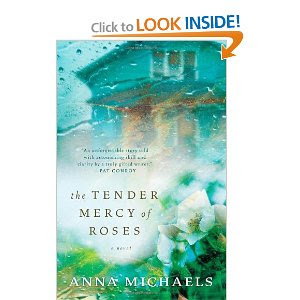 The Tender Mercy of Roses has a nice scent to it. It blossomed into a good book. Pony Jones was just twenty six years old when she was murdered. Pony had so much potential. She was one of the best rodeo riders. She could even out ride some of the men. Could this be the reason why Pony was murdered? Pony’s father, Titus knew the moment Pony was no longer on this Earth. He saw the signs and a wolf visited him. Jo Beth Dawson used to be a good cop, until her drinking and a failed marriage got the best of her. Jo Beth would rather be left alone but when she found Pony’s body in the field of roses, she knew that she could not just walk away and leave Pony. Sam Donovan is in charge of the murder case. He used to be Jo Beth’s partner. When Alice was fourteen. Her father, Matt Bliss left for war. He left her, her sister, Ellie and their mom, Angie to care for themselves. Every day after that, Alice would wear her father’s blue shirt as it smelled like him. 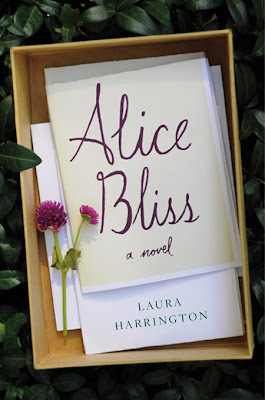 Their mother dropped out of touch with reality, causing Alice to care for her sister. At first Alice wanted to do things that their father did with them like eat backwards dinner. This was dessert first or send pictures of her and him together in his care packages. Though, the longer that their father stayed gone, the harder it became to hold onto memories of him. 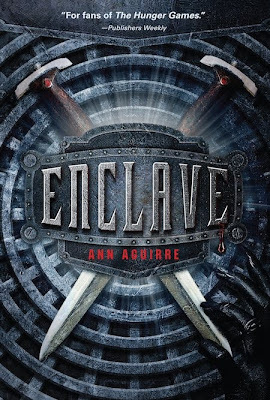 Enclave will have you sitting on the edge of your seat! Deuce always knew that she was born to be a Huntress, not a Breeder or a Builder. Now, everyone will know Deuce and not look at her as Girl15. Every boy and girl had no name and was just known as boy1 or girl 10 until they turned fifteen. Than, the boy or girl was given a name and put into one of the three groups. One of the most important tasks that a Hunter is responsible for is venturing outside of the enclave and through the tunnels to hunt for food and bring it back. Though, it is not easy. Once you leave the safety of the enclave a hunter can encounter the vicious Freaks. Lucian Glass has had a hard life. A talented artist, he is rocked by the death of his lover, Solange Jacobs in her father’s gallery. Mr. Jacob restored art and, after closing one evening; someone breaks in and steals a priceless Matisse, killing the girl in the process. Nearly killing Glass as well which might have been a blessing since he obsesses with Solange and cannot find a way to let her go. He is with the FBI Art Crimes Team and researches art theft, fraud, etc. Someone wants a statue that is in the care of the Metropolitan Museum of Art. A very, very old statue of Hypnos, the god of sleep. Nothing sleepy going on here, though. A group of folks called Resurrectionists, thinks the statue contains certain gems to help people recall their past lives. They will stop at nothing to get their hands on it, and some folks right in New York also want it for the same reason – it contains what they refer to as Memory Tools. In The Case for Falling in Love, Mari helps show readers that everything you read in self-help books can actually sometimes be damaging versus helping you. Yes, you could follow the advice in these books if you want to get a guy or girl but what if you are looking for”love”? I am not talking about the stuff you read in romance novels, though we would all like to have that but I am talking about “real” love. Myth: Men prefer women who let them take the lead. Fact: Many quality men are looking for an equal relationship with a competent and independent woman. Myth: The best way to win a man’s heart is to play into his fantasies of femine desirability. Fact: This is one of the best ways to get your heart broken. 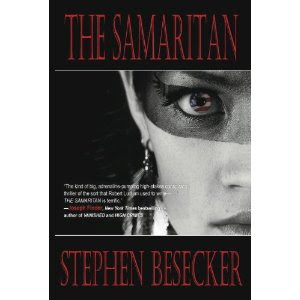 If you like mysteries than check this book out. 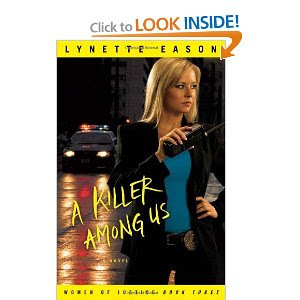 Kit Kenyon finds herself in a hostage situation. A husband is threatening to kill his wife because she wants to leave him and take the children. Kit thought she had the situation under control, only to have it end badly. 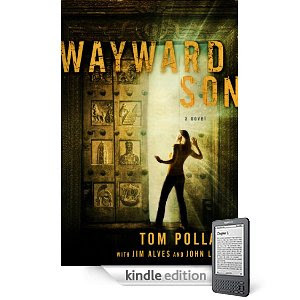 Noah Lambert and Kit are thrust into a string of gruesome murder cases. It seems that this serial killer deals out his own justice. He left the following message on his latest victim that said “Life’s a laugh. How does the death penalty feel? An eye for an eye.” As Noah and Kit track down the killer, it seems that the killer is also watching them. 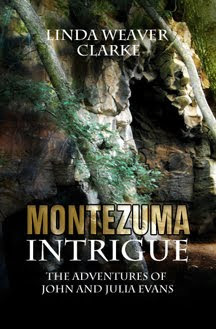 Mysterious events, the search for Montezuma’s treasure, a good-looking rogue, and family secrets! How important is it to learn about the past? Will it make a difference in one’s life and the choices we make? To April, it makes a big difference. Knowing about her parentage changes her perspective of life. All good little girls go to bed at night and wake up to see their parents. However…Gelsem was a very good child and it didn’t work out for her. She wakes up in a wooden stall on a Level she’s never been to before. Gelsem’s land is made up of many levels. She was born and partly raised (being only 13) on Level Gee where everything begins with “G”. (Her brother Gary, sister Glory, etc.) Animals begin with G, as does everything else. So, where is Gelsem now? After a bit of looking around she discovers she has been kidnapped and dropped off on Level Pee. AKA Penitentiary Level. Oopsie! 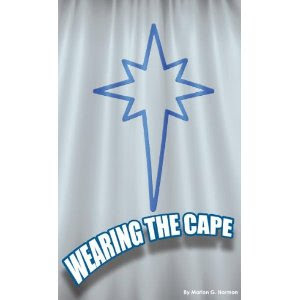 Wearing the Cape will have you wishing you were a superhero! Passing for “thirty-seven in candlelight” Annie is chaperoning her two children on a country-wide tour with the Phil Klein School of Rock. From Pennsylvania this isn’t really her world. But it was. Once. Annie spent a lot of time when she was seventeen with her dad. Who dealt coke to any and everyone. He was a drugged-out jazz musician from the beginning who didn’t want to be a father, much less a husband. 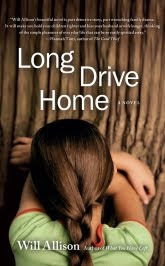 Separated from Annie’s mom, she was sent to NYC to live with him as a wake-up call – and to get her away from Johnny who has suddenly become her soul-mate. Unfortunately, it didn’t work. Daddy was dealing to GOD (aka Mick Saunders) and he was Annie’s hero/savior/lust bunny. When Annie goes to help Dad deliver, she stays with God. And then stays for months until her mother becomes ill and she has to return home to care for her and to confront John. Mick was off on tour and it’s been twenty years since they have spoken. Becky and Jon are a couple. They are heading to Paris for a trip. They invite Charlotte, Adrian and Marco to come along. While dining out, the group meets some locals. The locals offer to show the group around Paris. This is a bad idea as the group will soon discover. 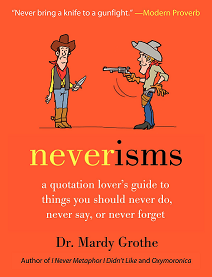 Neverisms is an intriguing book that is filled with interesting facts and sayings. This is a book where it is ok to flip though the different chapters and not sit and read it all the way through. In fact, at times it can read like a text book or dictionary. While I did enjoy learning different facts and tid bits about neverisms, I found myself at times flipping through the pages to read about more neverism wisdom in the form of advice. “Never try to reason the prejudge out of a man. 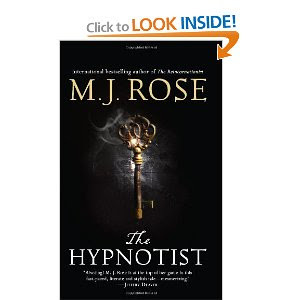 It was not reasoned into him, and cannot be reasoned out.” By Sydney Smith. “Never turn down a job because you think it’s too small; you don’t know where it can lead.” By Julia Morgan. 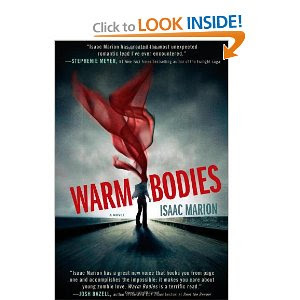 Warm Bodies is a zombie-fest of fun! “R” is one of the undead…zombies. His friend is “M”. He is also a zombie. R has come to accept that he is dead, though R may never get over the thoughts of feeling on humans. Yes, it is a way of life but not something that R thrives on. While out on of their many feedings, R and M attack a group of young adults. One of the things about the feedings is that whatever human R feeds on, he gains that person’s memories for a brief while. This time is a young man by the name of Perry Kelvin. Perry has a girlfriend named, Julie Grigio. R feels something while experiencing Perry’s memories. R claims Julie as his own. Soon R and Julie are developing a relationship that one would never expect to blossom. Glen Bauer would consider himself a pretty good driver. He always stopped at red lights and used his turn signal. Though that all changed all day. A young man talking on the phone and driving a Jag cut in front of Glen, nearly missing hitting him and just kept driving. Glen decided to let the incident pass and take his six year old daughter, Sara home. Glen is approaching their driveway, when he spots the young driver again. This time Glen decides to teach the man a lesson. Glen steers the car towards the man. The man loses control of the car and it flips over heading towards Glen and Sara. At the last moment the car is stopped by a tree. The outcome is not good…the driver who’s name is Juwan Richards is dead. The only witnesses to the accident are Glen and Sara. Glen thinks that he might have gotten away with vehicular manslaughter but Detective Rizzo will not stop until he discovers the true. Several years ago I stood knee-deep in the Pacific Ocean, teeth chattering, wondering what on earth would possess a sane man to join the Navy SEALs. I was on Coronado Island that day, and my mission was partly tourism and partly research. I had decided to write a SEAL character in my next book, and had spent the past few months researching what many would call the most elite fighting force in the world. Alex Miller is an attorney. He works for Cromwell Altman. 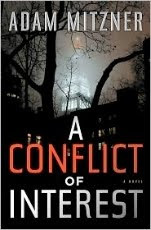 While attending his father’s funeral, Alex is approached by a man named Michael Ohlig. Mr. Ohlig wants to hire Alex to represent him. It seems that Mr. Ohlig helped a lot of stock brokers keep from losing a bunch of money, by advising them to sell their shares from a company that was going under. It is Alex’s job to prove that Mr. Ohlig had no prior knowledge that this company was going under. What Alex under covers will bring more questions than answers. Jake Daniels was involved in a really bad car accident. One that he should not have survived. It might have been better if Jake had died. Since the accident, Jake has been experiencing some odd symptoms. One is the reoccurring dream that he has of the accident that involves Jake disemboweled from himself and mysterious woman who is trying to tell Jake something. Jake feels a strong pull to learn the truth behind the accident and who the mysterious woman is and her involvement. Jake goes on a road trip to interview the other people who saw or were in the accident like Jimmy Harrison, the driver. Jake is not very religious but he could not deny some of the signs…the blinding lights, the woman, the 911 call prior to the accident. Jake starts researching on the topic of angels. The warriors have escaped Deirdre’s grasp. Now that she has been defeated for the current moment. While checking for survivors, they come across an injured woman. Hayden for some unexplained reason feels very protective of this woman. Though, when he learns that she is a druid, Hayden’s feelings toward her are still of lust but he also is guarded around her. His family was destroyed by druid magic. Isla is a druid but she was just a prisoner of Deirdre’s as the MacLeods and the rest of the warriors. Isla knows that every moment that she is recovering that Deirdre is as well. Though, there is one upside to staying with the MacLeod’s…Hayden. Isla can not deny the lust she sees in his eyes every time he looks at her. Diana Highsmith has not left her house since her husband, Daniel died. While on a hiking trip in Switzerland, Daniel’s rope came lose and he perished. Diana can remember watching Daniel fall to his death. Since than, Diana has built herself a fortress and the main way that she interacts with people is through a virtual reality world, known as Otherworld. When, Diana’s sister, Ashley goes missing, Diana will have to leave her virtual reality world and venture into the real world. Can Diana survive the real world? The feud between the Wainwrights and the Caldwells has been going on for many years. Now, Sarah and her brothers are caught up helping their father with another scheme to get back at the Wainwrights. This time Sarah is ordered to distract Cord Wainwright, while her brothers and father made off with the Wainwright money. Let’s say that Cord is not pleased. The next day, when Cord spots Sarah in town, he decides to take her to the sheriffs and have her arrested. Unfortunately, the sheriff is out of town for three days. Cord does not plan to let Sarah get away. 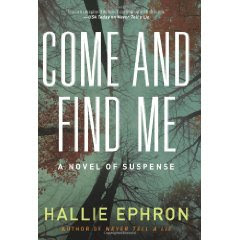 He kidnaps her and brings her back to his place until the sheriff returns. Sarah grows close to not only one Wainwright brother but also another…Cord’s older brother, Nick. This feud just got more interesting. Amanda, budding archaeologist; goes to Italy to assist in what just may be the Find of a lifetime. Or, it just may end her life. When asked by her ex-love Juan Carlos to fly over and assist in reading a set of panels Amanda jumps at the chance to get away for awhile and to see if there is possibly something left of an old flame. The panels are massive but Amanda is able to decipher the lettering and to also solve the puzzle to open the doors. So far so good. Then things get really interesting. She is wandering around in a huge chamber when she begins to have a vision. Not fairies and dragons; not vampires or werewolves. Nope. Olivia Stewart is almost past marriage age. Though, she is only twenty-five, which is not that old, when you live in a society like Olivia, twenty-five is considered a spinster. Olivia and her mother are in desperate need of money. 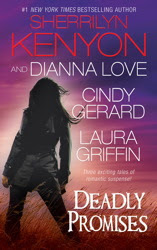 When they learn that Olivia’s sister, Eleanor has drowned prior to marrying her fiancé, Harrison Bennett, this is bad news. Both that Eleanor has died and without Harrison being married, Olivia’s mother has lost rights to part of the diamond mine. Before Olivia can stop her head from spinning, she is offered up to Harrison as his new wife. Olivia has suspicions about Harrison. She believes that he had something to do with Eleanor’s death. She aims to learn the truth. Comment with your email address and tell me which books you want to win. If you want to enter for both, than which is your first choice. Giveaway ends May 28th. Are you unhappy with your life? Do you wish that you could take a happy pill and things would magically be like sunshine and rainbows? Well it can be. Ok, so maybe not really but you do deserve to be happy. We all do! 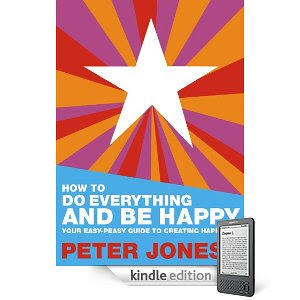 In author, Peter Jones book, How to Do Everything and Be Happy, Mr. Jones helps provide you with the tools to make some changes in your life and start doing the things you want to do and not what you have to do. First off, I do want to warn you that Mr. Jones does not make you promises or try to preach to you, he only shares with you his experiences and what he did that helped make a difference. What you decide to do with this information in this book is up to you. 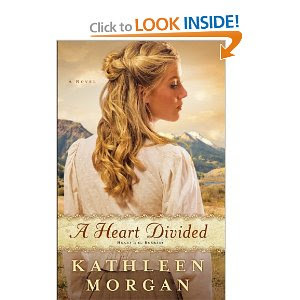 I can tell you though that I was not finished reading this book and already I was talking to my co-worker about it. 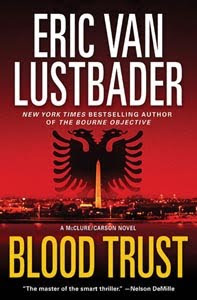 Unable to close his previous case against the Monument Bomber, Senior FBI Special Agent Zane Rigby has been re-assigned to uncover a secret. Is Abraham Lincoln's body in his grave? 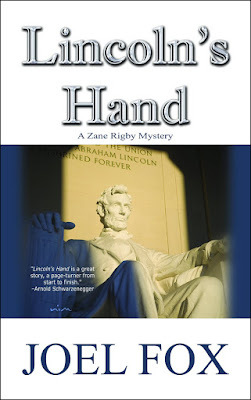 When DNA from a hand found with a blackmail note traced back to 1901 matches the DNA from bone taken at Lincoln's autopsy, Rigby is shuffled off to Springfield, Illinois where all manner of obstacles threaten his success. He discovers a local congressman hiding a dreaded secret, a strange doctor who claims he can perform medical miracles, and his own ill-timed urge to rekindle a relationship with his college sweetheart. And then there is the dead body of a young woman found near Lincoln's Tomb. 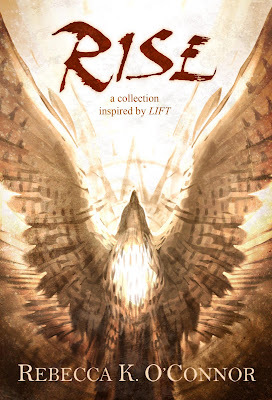 As the Monument Bomber threatens to strike again, Rigby searches for redemption in solving the murder and discovering the secret buried in Lincoln's Tomb.